Dimension (Length x Width) 72" x 36"
We bring forth to our clients Sleep Maker Mattress that are made from cotton fabric. These are available in attractive colors and designs and are also provided with a sag proof as inner layer of bonded foam. This foam acts as spring and helps the mattress to bounce back to its original shape. These reliable products are widely appreciated by the customers for providing comfortable and stress-free sleep. Material - Natural Latex and coir fibre. Application - Domestic as well as hospital uses. Type Single, 72" X 36" X 5"
We provide Value Plus Mattresses that are comfortable and ensure great sleeping pleasure. These mattresses are available in a size of 102 mm along with 14 mm foam quilting colorful glazed cotton satin fabric. Our value plus mattresses are also provided with sag proof as inner layer of bonded foam that works as spring & helps the mattress to bounce back to its original shape. 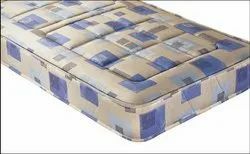 These mattresses combine rubberized coir with bonded foam, which further helps in ensuring a long life. Looking for Orthomedical Coir Mattress ?